Europe is the only region worldwide to have recorded a positive M&A performance in the first quarter of 2019, with European dealmakers outperforming their regional index by +2.8pp (percentage points), according to the latest results from Willis Towers Watson’s Quarterly Deal Performance Monitor (QDPM), run in partnership with Cass Business School. A three-year rolling average performance of +5.1pp above their index puts European acquirers in the top spot, driven by consistent outperformance in the previous six quarters, followed by North American and Asia Pacific acquirers which have underperformed their regional indices over the same period by -1.1pp and -5.5pp respectively. UK M&A performance also remains in line with the positive performance of European buyers, with the five deals over $100m that took place performing on average +5.7pp above the index. UK acquirers have consistently outperformed their region since the launch of the Index in 2008 (+3.9pp), in the last three years (+3.7pp) and in the last year (+3.9pp), despite the continued uncertainty of Brexit. Confronted by a volatile dealmaking environment impacted by global political uncertainty, from trade wars to growing protectionism, the global M&A market as a whole underperformed for an unprecedented sixth consecutive quarter, on average underperforming the Index by -5.4pp in the last three months. This performance also represents a significant decline compared to the same period in 2018 (-0.6pp). 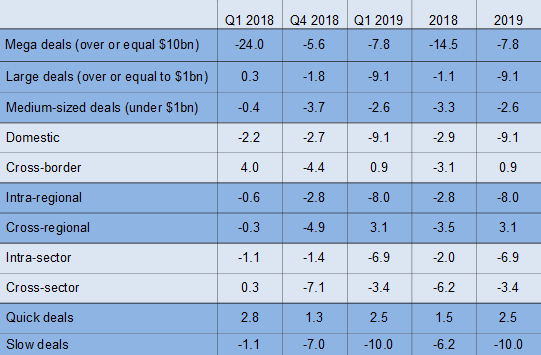 Acquirers in North America showed an especially sharp decline of -10.1pp, which is the region’s worst performance since the Index launched, while acquirers from Asia-Pacific underperformed their regional index by -5.0pp. “The poor results from the North American M&A market, traditionally shown to be very robust, reflect an increasing focus on targeting domestic acquisitions – fuelled partly by the US tax reform law changes. Experience is showing that this has so far proved unprofitable and dealmakers should instead be looking for the best deals, rather than limiting themselves to targets that take advantage of current domestic policy,” said Jana Mercereau. The three-year rolling average performance is currently at -0.9pp, which is the first time this average has been negative since the launch of the Index in 2008. Most deal types underperformed. The biggest underperformance for the quarter is Slow deals currently at -10.0pp. Both Large and Domestic deals are currently at -9.1pp. Cross-border, Cross-regional and Quick deals outperformed the index by +0.9pp, +3.1pp and +2.5pp respectively. The first quarter saw just 180 deals closed, which is the lowest quarter figure since Q1 2014. This is principally due to the continued decline in the number of Asian deals. 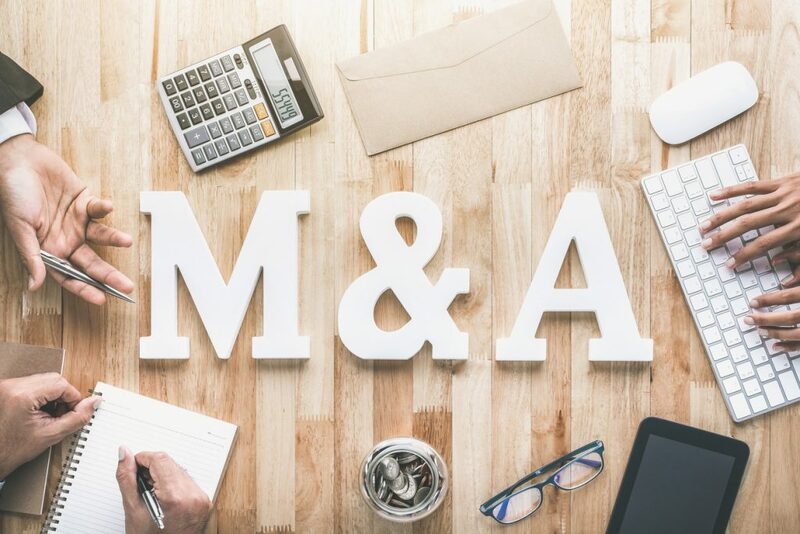 “Growing cash reserves, technology disruption, the slowdown in the growth of emerging markets will continue to drive companies to get into the M&A market,” said Jana Mercereau. “At the same time, the market stress that characterised last year remains and many targets are now looking more expensive than they did during previous M&A peaks, such as in 1999 and 2008, making it as challenging as ever to deliver deals successfully.